A month ago, I wrote that it’s not yet time to worry about a recession. Since then, economic indicators have gotten a little worse. It’s still not time to panic — but there’s reason to be a little more worried. What’s changed in the last month? Two main things: We got a weak jobs report for February after several strong reports, and the Treasury yield curve inverted. That is to say: The interest rate on three-month government bonds is now higher than the interest rate on ten-year government bonds. Inversion is unusual — normally, longer bonds pay higher yields than shorter bonds — and it tends to happen when market participants expect the Fed to need to cut interest rates in the future. Typically, if the Fed is going to need to cut rates, that’s because the economy is going to be weak. So yield-curve inversion, seemingly a dull technical matter, can be a strong predictor of a coming recession. Still, there are stories you can tell about the yield-curve inversion other than that we’re about to enter a recession. The yield curve does not reflect a direct prediction of economic conditions by market participants. It reflects a prediction of interest-rate conditions, which is often driven by a prediction of economic conditions. When we use the yield curve to forecast economic conditions, the assumption is that the Federal Reserve’s interest-rate setting activity will be driven by an accurate assessment of economic indicators by the central bank; if the curve shows that the Fed is expected to cut rates in the future, that means there’s trouble ahead. But what if market participants have other reasons to think the Fed is likely to cut rates in the future? Suppose, hypothetically, you had a president who was noisily complaining that the Fed had set rates too high and should cut them. Suppose the Fed spooked both markets and political actors by seeming too inflexible in its rate-hike position — and then aggressively sought to reverse that message by clearly indicating an intention to be dovish on rates for the foreseeable future. 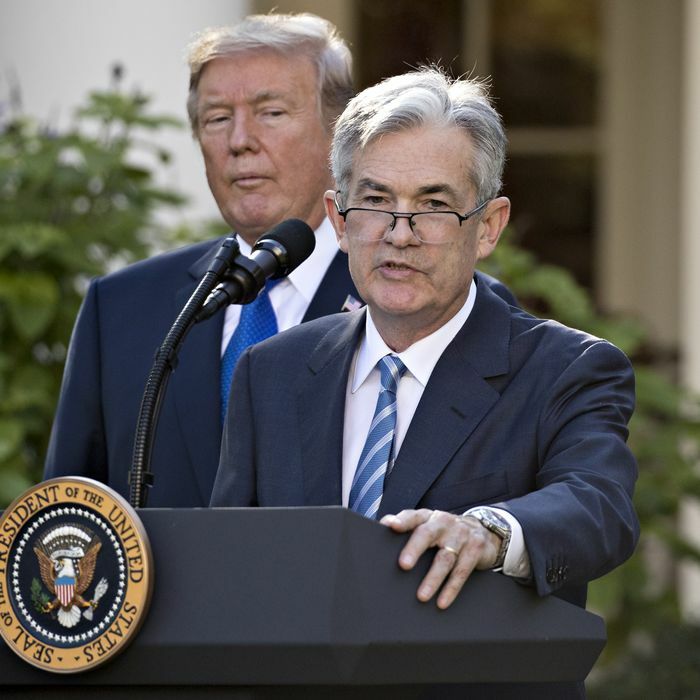 Suppose the president nominated a political supporter who was urging steep interest-rate cuts to sit on the Federal Reserve Board. Suppose that nominee had recently called for the Fed chair to be fired for hiking interest rates. Of course, none of those things are hypotheticals. They’re things that have actually happened in the last three months. They all give market participants good reason to think the Fed might cut rates in the next year or two, even if we are not headed for a recession. So, they’re all plausible reasons why long-term interest rates have fallen so much in recent months — fallen so much they’re now lower than short-term interest rates and the yield curve has inverted. I started to wonder: Is it possible President Trump has caused the yield curve to invert simply by engaging in a public pressure campaign toward the Fed? Duy did note it wouldn’t have to work this way: A presidential attack on the Fed’s independence could cause long-term interest rates to go up, because investors could worry that political interference would lead to higher inflation. This is the pattern that was seen in the United States in the 1970s and is in some other countries where the central bank is subject to excessive political interference, and it is the opposite of yield-curve inversion. But a more modest level of political interference — where the president’s jawboning might be expected to cause the Fed to set rates a quarter- or a half-point lower than it otherwise would — might push down market expectations about long-run interest rates without spiking inflation fears, causing a yield-curve inversion, Duy said. Still, my hypothesis is not Duy’s primary hypothesis. He sees the recent changes in long-term interest rates as being driven mostly by economic fundamentals, not political pressure. The Fed has twice cut its forecast for economic growth — still expecting positive growth, but closer to 2 percent than 3 percent — and it has gotten less worried about the prospect of higher inflation. Both of these shifts in expectations mean the bank has substantive economic reasons to set interest rates lower in the future than it otherwise would have, whatever the president’s mood and preferences. Markets have digested the bank’s shift in outlook and long rates have fallen accordingly. That’s the more normal inverted-yield-curve story: The curve inverts because the economic outlook is starting to look weaker. But “weaker” doesn’t necessarily mean a recession. Tedeschi told me he’s hearing from Wall Street analysts who think the Fed is likely to shift from its “wait and see” stance to cutting rates by a quarter- or half-point in order to boost an economy where growth might slow to about 1.5 percent a year, which is below the Fed’s expectations for long-run economic growth. The expectation of those coming rate cuts would be a reason for the curve to have become inverted. Duy proposed a similar scenario: That Fed action to cut rates could support the economy and stave off a potential recession. He pointed to the experience in 1995–1996: The Fed cut interest rates as the economy cooled, but it never entered recession. Duy says he will be closely watching jobs reports in the coming months. Despite the weak February report, the broader picture of the employment situation continues to look incongruously strong compared to more worrying data on economic output and financial market signs of economic jitters, such as the inverted yield curve. Employment data can be a lagging indicator, and weaker numbers in the second quarter would provide greater reason to worry about slowing growth. Still, that slowing growth could be less than a full-blown recession, especially if the Fed acts as aggressively to counter any slowdown as the president would clearly like it to.